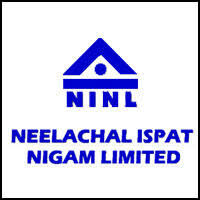 Bhubaneswar: Odisha-based Neelachal Ispat Nigam Limited (NINL) bagged the best performer award in energy savings under the Perform, Achieve & Trade (PAT) scheme in the iron and steel sector by Bureau of Energy Efficiency (BEE), Ministry of Power, Govt. of India. The award was presented on the occassion of National Energy Conservation Day celebration in New Delhi on December 14, 2017 where Honb’le President of India, Shri Ram Nath Kovind was the Chief Guest. Shr Raj Kumar Singh, Union Minister of State (Independent charge) for Power, New and Renewable Energy was also present on the occasion. 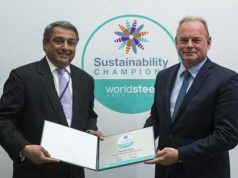 Shri S.S. Mohanty, Vice-Chairman & Managing Director, NINL received the award on behalf of the company from Shri Abhay Bakre, Director General, Bureau of Energy Efficiency. Shri A.K. Panda, Head (Power Plant), NINL was also present from the company. With the aim to make the industrial sector energy efficient, BEE had launched its ‘Perform, Achieve and Trade’ (PAT) scheme. NINL, promoted by MMTC Ltd (GoI), IPICOL, OMC (GoO) and other govt. agencies, has set up an 1.1 integrated Steel plant at Kalinga Nagar, Odisha. Presently the products are Steel Billets, Pig Iron and LAM Coke along with Nut Coke, Coke Breeze, Crude Tar, Ammonium Sulphate, Granulated Slag, etc.